The Amigo Bug Vamoose is made of strong polyester with a smooth polyester shoulder lining to prevent abrasions. This blanket contains Vamoose, an anti-insect technology. Vamoose is a color and odorless agent that keeps flies and other insects at bay. This product remains effective for an average of 20 washes. 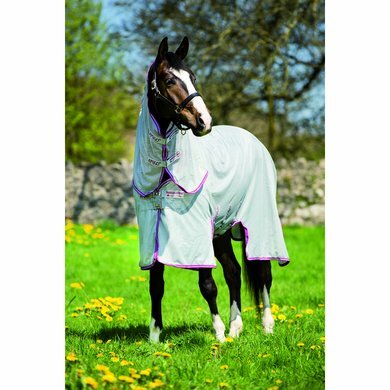 The blanket is also 85% UV radiation resistant, not waterproof but suitable for attaching a waterproof liner. 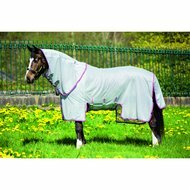 The multifunctional blanket comes with a detachable neck, to be attached with velcro fastening and with smooth polyester maneuvering. The blanket has a double hook / eye closure on the chest, reinforced with Velcro. 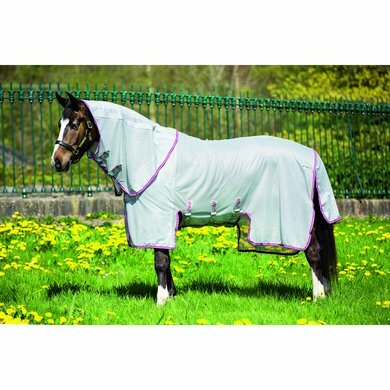 In addition, the blanket has three straight adjustable belly girths and a belly flap for extra protection. Finally, the blanket has long sides with a recess at the belly for optimal freedom of movement, an extra long tail flap and a single bil cord. Very good blanket, slightly narrower at the shoulders than a standard blanket. Keeps nicely in place, also when rolling and crosses in the meadow. Good quality. Well-known quality. Beautiful colors. Fit very well. Very nice fly rugs, remains great! Is already the 2nd that I bought. 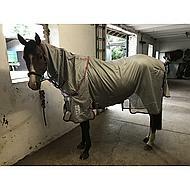 For my horse the best fly rug! The blanket is great. All summer our horses had the blankets and the blankets still look like new. The fly blanket was neatly at my Tinker crosses and stayed well, even after rolling. No grinding or pressure spots. We did not notice much of the Vamoose, except that there is a typical smell on the blanket. The flies just sit on the blanket, despite the Vamoose. We did not use the neck, so I can not say anything about that. Question: Hello, is a fly repellent incorporated here? Answer: Yes, this blanket is equipped with the Vamoose anti-fly technology. Vamoose is produced on the basis of permethrin and is harmless to humans and horses. The Mittelk works against ticks, mosquitoes, flies and fleas. Answer: Yes, this blanket is actually equipped with anti-fly technology. Vamoose is a made from permethrin fly repellent, which also acts defensively against ticks and mosquitoes. The remedy is harmless to humans and horses. Answer: True, this blanket has two Velcro strips under the belly. Question: does the Amigo Bug Buster Vamoose have a detachable neck? 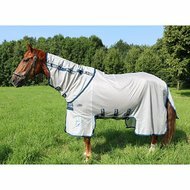 Is this a lightweight fly rug? Is the blanket spacious? for 1.95 size I would want them spacious which order me? Answer: This blanket has a detachable neck. This is a lightweight fly rug. The blanket is slightly larger, if you doubt you could order a size or half size smaller. Question: Is this blanket with detachable neck? If not, which is with detachable neck and long flap for the legs? Answer: This blanket has a detachable neck. Answer: This blanket has no belly flap but the sides are extra long so the blanket through the 3 belly girths almost the entire belly covered.